Invisalign in Rockville, MD | Potomac Dental Clinic, Inc. Many people look for an aesthetic solution to improve teeth alignment, whether they have crooked, gapped, or crowded teeth. Where metal braces are an extensive and involved treatment, Invisalign® clear braces correct many issues in a convenient and comfortable way. At Potomac Dental Clinic, Dr. Parvaneh Sajjadi provides Invisalign aligners to teenagers and adults who desire a uniform and beautiful smile. With extensive experience correcting dental alignment problems, Dr. Sajjadi knows how to optimize treatment. Our Rockville practice administers Invisalign braces to Bethesda, Potomac, Gaithersburg, and all surrounding areas. Call us for a consultation and experience the transformative benefits Invisalign has to offer. Invisalign trays are made from a clear, strengthened plastic which gently applies pressure to shift teeth. These aligners work effectively because they are molded to your unique smile, based on impressions taken by Dr. Sajjadi. These custom aligners target your specific orthodontic issues. The duration of each Invisalign treatment varies but can be completed within a year for some. These clear appliances give you the confidence to smile, speak, and eat normally. During mealtimes, you remove the aligners, which protects them from damage and permits you to eat as you like. You can also maintain hygiene habits without using specialized tools. This freedom is unique to removable clear braces, allowing many to obtain the smile they desire with ease. As an additional feature, Invisalign aligners help many patients whiten their teeth. The custom trays make sure the whole smile is evenly whitened, lifting stains on every tooth. 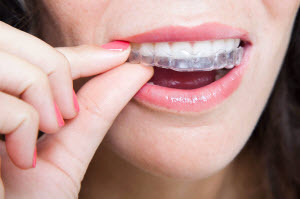 Invisalign clear braces are well-known for making smiles straight and beautiful, but they also improve your oral health. Ideal teeth alignment allows you to effectively keep teeth clean, eliminating food debris from hard-to-reach areas. Straight teeth also improve bite balance, limiting the uneven wear caused by misalignment. A proper bite reduces the strain put on the temporomandibular joint (TMJ), which can reduce overall jaw soreness. Dr. Sajjadi is proud to offer Invisalign aligners to give patients an improved quality of life and the smiles they deserve. For an Invisalign Consultation, Call Potomac Dental Clinic! To see if these clear braces are right for you, visit our practice. Dr. Sajjadi thoroughly examines your smile and determine whether Invisalign braces can meet your dental goals. Our practice treats patients from nearby areas and all over the world. Call our practice today to schedule your consultation!